As the wind picked up and the rain became a spitting mist, nothing could keep the smiles off of everyone’s face or wane the excitement that buzzed around the Biogen campus in Weston, Massachusetts as electric vehicles and bicycles arrived for the kick-off event for MASS DRIVE CLEAN’s third annual event season. People discuss EVs before getting behind the wheel for a test drive. Before the event started at 10 AM, a line was already forming at the outdoor registration table. Friends and colleagues chatted amongst themselves as to which vehicle they would test drive first. Eager eyes scanned over the waiting vehicles which included BMW, Ford, Mercedes-Benz, Porsche, Toyota, Tesla, and Volvo. Participants expressed an interest in several vehicles, often test driving more than one. Each vehicle never sat longer than five minutes. There were also a handful of people who simply came out to test ride the electric bicycles. 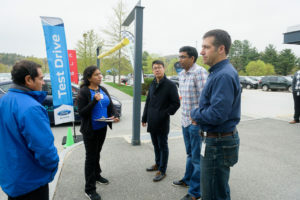 Even after 30 EV test drive events in the New England area, such as Biogen, I am still in awe by the excitement that they generate. My favorite part, without fail, is listening to participants talk about EVs while they wait, stating how they likely would not purchase one, and then talking to them after they get back from their test drive. This event produced 207 EV experiences from which 17% of all participants stated they expected an EV to be their next vehicle. However, after test driving, 31% expect their next vehicle to be an EV! 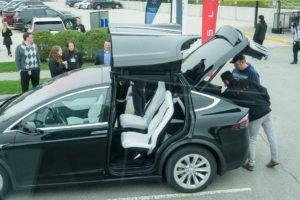 It’s amazing to see almost one hundred people come out on their lunch breaks or between meetings on a cold, wet spring day to test drive a vehicle that they may not have previously cared about. MASS DRIVE CLEAN, the nation’s first state-sponsored electric vehicle test drive campaign, received its seed funding from The John Merck Fund and is sponsored by the Massachusetts Department of Energy, Massachusetts Executive Office of Energy and Environmental Affairs, National Grid, and Plug In America. This initiative is an educational engagement campaign to introduce the Bay State to this new and exciting technology while building on its commitment of reaching a roadmap goal of 300,000 zero emission vehicles (ZEV) as stated in the 2013 signed ZEV MOU. As the third year officially begins for MASS DRIVE CLEAN, I am looking forward to hitting new benchmarks by creating unforgettable experiences for every participant, dealership, and host we work with. If you attend one of our many events, look for me, I will be the one smiling, ready to hear your thoughts on driving electric.